How to Make a Model of Earth’s Layers – Spice Jar Style! A couple of weeks ago while at my sister’s house, I noticed a nifty layered spice jar sitting on her window sill. When I asked where she got it, she told me that my niece made it for school – it was a representation of the Earth’s layers. It was so cool that I asked my niece to tell me how she made it so that I could share it with y’all. I’ve shown you how to make a paper mache Earth and a construction paper model of Earth’s layers. Now, I give you How to Make a Model of Earth’s Layers – Spice Jar Style! Step 1: Cut the piece of cardboard to fit as snugly inside the middle of the jar as possible. The Earth’s layers jar will be split into two sides, one showing the compositional layers and the other showing the mechanical layers. Optional: I wadded up a small piece of plastic wrap to place into the bottom of the jar before placing the cardboard inside. This created a snug fit in the bottom of the jar and was easily concealed by the first layer of spices. And, just for fun, we did a small layer of green sprinkles on the top to represent grass/growing things. Step 3: Begin layering! We did one layer at a time on each side of the cardboard to try to keep it from getting pushed to one side and possibly causing us to lose the distinction of each layer during the layering process. We attempted to keep the layers fairly proportional to those in the diagram, but we didn’t get too technical with it. We just eyeballed it. Optional: Place a bit of wadded up plastic wrap on top of the layers to fill in any remaining space between the spices and the jar lid to prevent shifting. You might also choose to use a Sharpie or dry erase marker to label the layers. 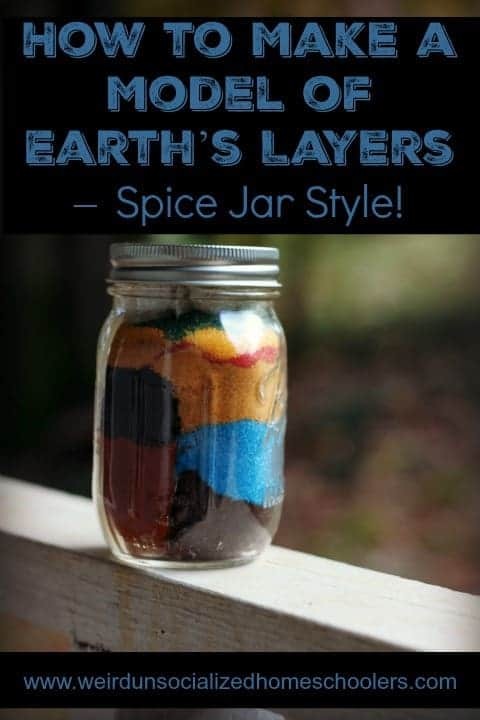 There you have it – a simple, but fun and effective way to represent the layers of the Earth in a colorful spice jar! This post is linked to the Hip Homeschool Hop and Finishing Strong.